Skeletal variation is common in mammals, even within a single species. Figure 1. 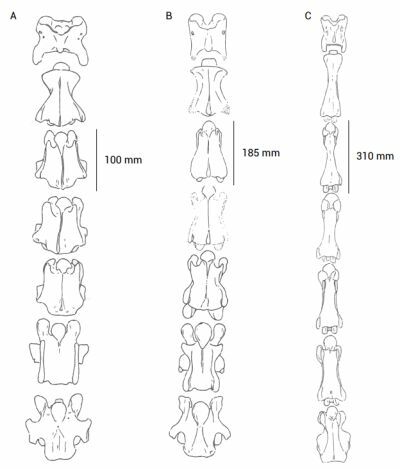 C1–C7 vertebrae (from top to bottom) of (a) Okapia johnstoni, (b) Samotherium major, and (c) Giraffa camelopardalis (figure 7 from Danowitz, Domalski, and Solounias10). The authors address the position the neck is held at in the resting animal as it relates to the shape of the vertebrae and features of the skull. In some ruminants the head is held relatively horizontal, with the first cervical vertebrae (atlas, or C1) nearly the same level as the last (C7). This is seen in animals such as cattle and African buffalo. A semi-vertical position, where the cervical vertebrae are held around a 45° incline, is seen in the okapi and various species of gazelle. A more vertical position, with a greater than 60° incline in the resting animal, is seen in the gerenuk (a long-necked species of antelope) and the giraffe. Skeletal features of S. major seem to be most similar to the latter based on certain features of C1, C7 and the position of the palatine indentation (figure 1). Thus they conclude that S. major held its neck in a vertical position. There are other anatomical findings in S. major that are uncharacteristic of ruminants, namely a wedge shape of the cervical vertebrae as viewed from the side. Several muscles from the thorax insert in the caudal region of the cervical vertebrae, and the authors believe these regions are thicker in S. major to allow for a broader attachment. They feel this further supports their inference of a vertical position of the neck. S. major has other features not seen in either the giraffe or okapi. For example there are differences in the position of spinous process on C2 that may have allowed for more dorsal flexion of the head. 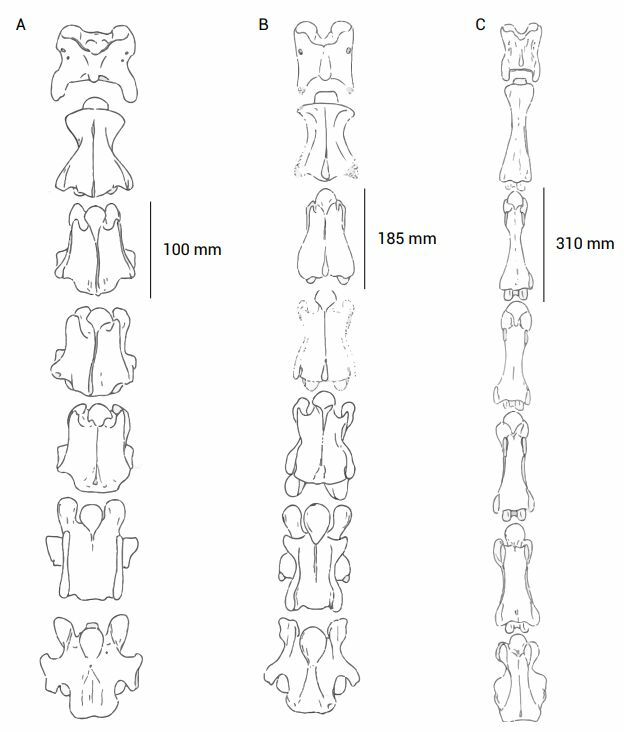 In the upper region of the spine (C2–C3; see figure 1) S. major has features that were a mosaic of okapi and giraffe characteristics. For example, the angle of the dorsal tubercle was similar to the okapi, while the angle of the spinous process was more similar to the giraffe. This pattern was seen for a number of other measurements in this region. In contrast, the more caudal cervical vertebrae (C5–C7) tended to be intermediate between the extant species. The only two species of the giraffe family that are alive today, the giraffe and the okapi, are on opposite ends of the spectrum when it comes to neck length. Evolution is often defined as change over time. Thus, evolutionists often point to changes within created kinds and claim it is evidence for evolution, the idea that all animals share common ancestry. 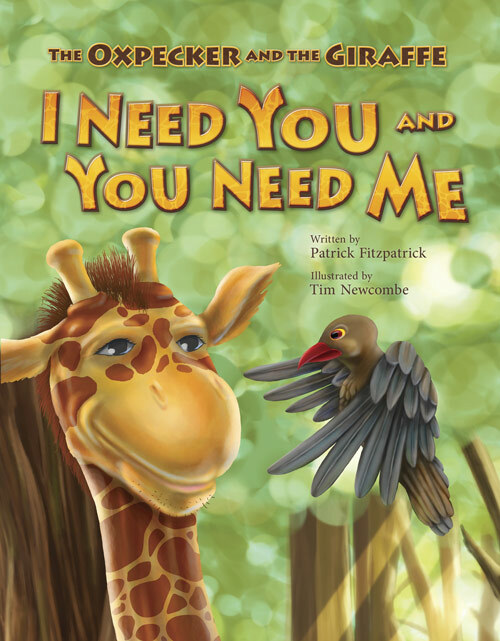 In the case of the giraffe family, there certainly have been changes. However, they do not support universal common ancestry. 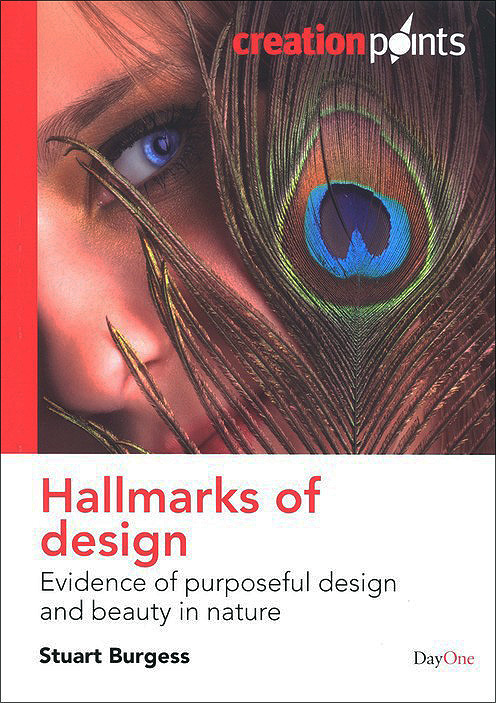 Within kind changes require that there is design to allow for the body to change without destroying the animal. Changes in size, shape, and even number of vertebrae require both an animal designed with these skeletal features as well as design in the animal to allow for changes (e.g. so the muscles still attach well and are useful). 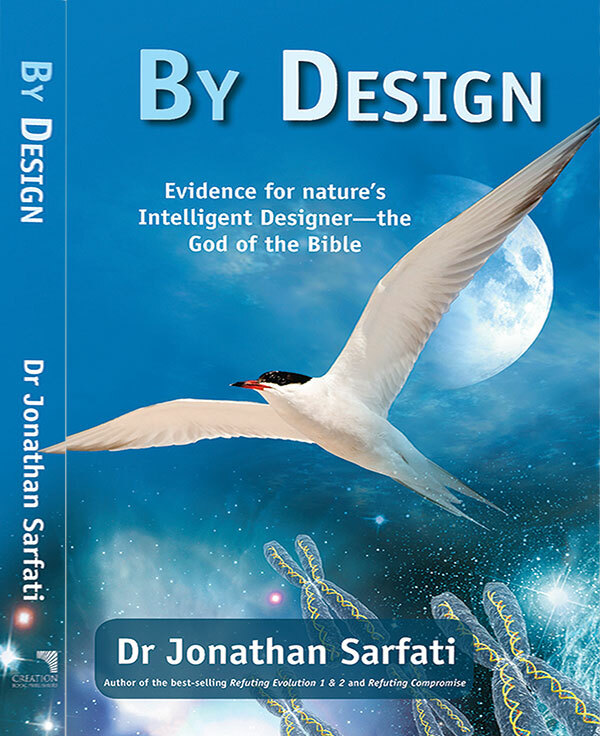 It is consistent with an awesome Designer who created his creatures to reproduce and fill the earth (Genesis 1:22; 8:15–17; Isaiah 45:18), adapting to various environments as they did so. 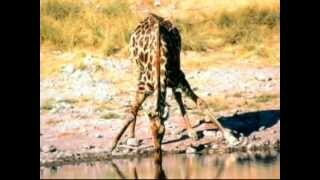 Do drinking giraffes have headaches? 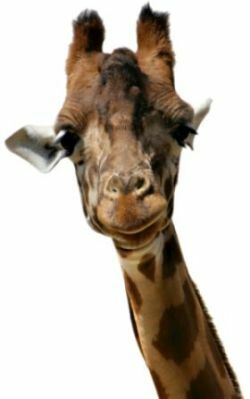 Cooper, D., Fossil bones from extinct cousin reveal how giraffe got its long neck, abc.net.au, accessed 6 January 2016. Return to text. It is not completely clear if the level of the kind is at the family, Giraffidae, or higher at the suborder, Ruminantia. Lightner, J.K., Mammalian Ark kinds, Answers Research J. 5:151–204, 2012; pp. 151, 191–193. Return to text. Rohrer, G.A., Nonneman, D.J., Wiedmann, R.T. and Schneider, J.F., A study of vertebra number in pigs confirms the association of vertnin and reveals additional QTL, BMC Genetics 16:129, 2015. Return to text. Santinelli, I, Beccati, F., Arcelli, R. and Pepe M., Anatomical variation of the spinous and transverse processes in the caudal cervical and the first thoracic vertebrae in horses, Equine Veterinary J. 48(1):45–49, 2016. Return to text. Turkof, E., Jurasch, N., Grassberger, M., Schwendenwein, S., Habib, D., Knolle, E. and Losert, U., Large interarcuate spaces in the cervical vertebral column of the Tyrolean mountain sheep, Anatomia, Histologia, Embryologia 32(1):9–11, 2003. Return to text. Badlangana, N.L., Adams, J.W. and Manger, P.R., The giraffe (Giraffa camelopardalis) cervical vertebral column: a heuristic example in understanding evolutionary processes?, Zoological J. Linnean Society 155(3):736–757, 2009. The only known mammals to vary from the usual seven cervical vertebrae are manatees (Trichechus) and sloths (Bradypus and Choloepus). This is in contrast to other vertebrate orders (e.g. birds, amphibians) where variation in the number of cervical vertebrae is quite common. Return to text. van Sittert, S.J., Skinner, J.D. and Mitchell, G., From fetus to adult—an allometric analysis of the giraffe vertebral column, J. 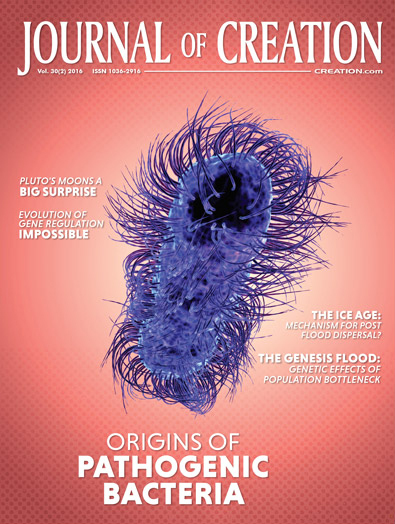 Experimental Zoology Part B: Molecular and Developmental Evolution 314(6):469–479, 2010. Return to text. Endo, H., Yamagiwa, D., Fujisawa, M., Kimura, J., Kurohmaru, M. and Hayashi, Y., Modified neck muscular system of the giraffe (Giraffa camelopardus), Annals of Anatomy 179(5):481– 485, 1997. Return to text. Badlangana, et al., ref. 6. Return to text. Danowitz, M., Domalski, R. and Solounias, N., The cervical anatomy of Samotherium, an intermediate-necked giraffid, Royal Society Open Science 2(11):150521, 2015. Return to text. Paton, J.F.R., Dickinson, C.J. and Mitchell, G., Harvey Cushing and the regulation of blood pressure in giraffe, rat and man: introducing ‘Cushing’s mechanism’, Experimental Physiology 94(1):11–17, 2009. Return to text.